Fire Damage is one of the most devastating and deadly disasters a property owner could face. With over twenty years of experience servicing their community with safe and efficient fire damage remediation, SI Restoration offers some valuable tips to home and business owners who find themselves plagued by fire, smoke, and soot. SI Restoration fire damage experts have spilled the beans on how home and business owners can successfully combat fire damage while restoring property to its original, livable state. When a fire ignites in a home or business, panic and fear overtake property owners and inhabitants. Prized possessions could turn to ash, decades of memories could be evaporated, and lives could be lost. When fire damage strikes, level heads must prevail in order to maintain safety of all of those involved as well as saving as much property as possible. SI Restoration, servicing the community with extensive fire damage services since 1989, has spent the better part of six months developing interactive guides for property owners unsure about the restoration industry. 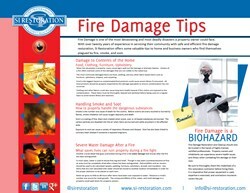 In their latest publication, Fire Damage Tips, SI Restoration fire damage experts have spilled the beans on how home and business owners can successfully combat fire damage while restoring property to its original, livable state. Fire Damage Tips is broken up into four main categories, giving exclusive insight on some of the details property owners may overlook when a fire devastates their residential or commercial investments. When fire devastates a property, many visual signs spell out the damage in dramatic fashion. Victims of a fire often overlook some of the damages that are not visible to the naked eye. The most commonly damaged items are food, clothing, and any other fabric-based items such as furniture, upholstery, drapery, and carpeting. Food is the biggest hazard as contaminated food products could cause severe illness if consumed. All food products should be properly inspected by fire damage specialists to ensure contamination has not occurred. Clothing and other fabrics could also cause long-term health hazards if fire victims are exposed to the contamination. These items must be thoroughly cleaned and sanitized before being used on a regular basis to avoid severe illness and reactions. One of the most commonly asked questions about fire damage is, “What is more deadly? Fire or Smoke?” Smoke is the number one cause of death for fire victims. Before victims are touched or burned by flames, smoke inhalation will cause oxygen depravity and death. Soot is a coating of fine, black dust created when wood, coal, or oil-based substances are burned. The carbon particles are dispelled into the air when items are burned and settle anywhere in the affected area. Soot is greasy to the touch and should be cleaned with dry means as much as possible before a “wet” clean is attempted. Exposure to soot can cause a variety of respiratory illnesses and disease. Soot has also been linked to coronary heart disease if someone is exposed long-term. Another crucial detail that goes overlooked during a fire is the water damage service that is needed after the fire has been extinguished. In most cases, water is used to douse fires big and small. Though it may seem counterproductive at first, an area must be completely dried after a blaze has been extinguished. Dehumidifiers and air movers should be used to dry saturated carpets, padding, furniture, upholstery, drywall, and insulation. Any items that are over-saturated with water should be moved to another location immediately in order for the proper attention to be placed on each item. Mold can grow as little as 48 hours after items have been over exposed to water. Moisture is mold’s number one source for mold growth. The compound effects of fire, water, and mold damage to a property could spell doom for property owners. Many fire restoration contractors also offer mold remediation service as many of the same practices are used for both types of remediation. Fire Damage Restoration and Cleanup should only be trusted in the hands of highly-trained, certified professionals. Property owners and inhabitants can experience severe health issues and illness when combating fire damage on their own. Be sure to thoroughly check the credentials of a fire restoration contractor before hiring them. It is imperative that proper equipment is used, expertise is exercised, and contractors insurance covers the job.